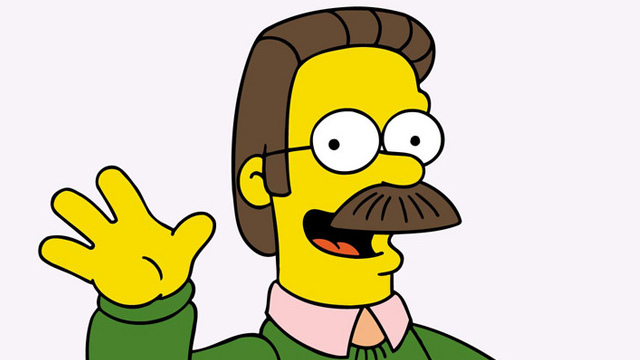 Every part of my nerdy heart is fluttering today because Harry Shearer is coming back to The Simpsons. A quick refresher: Harry Shearer, voice of Ned Flanders, Mr. Burns, Smithers, and Principal Skinner, announced seven weeks back that he wouldn’t be back for the 27th season of The Simpsons, the first he wouldn’t be involved with. This, fairly obviously, scared every Simpsons fan because of how central Shearer was to the show. No, he does not voice any member of the Simpson family, but in terms of importance his four main characters represent some of the most iconic creations of the show as a whole. Other people could have done the voices but the show just wouldn’t be the same. Shearer needed to be back. I’m not entirely certain what the agreement was to bring him back in the fold, but if money was involved then I am more than willing to pitch in. This should not come as a surprise, given I dedicated almost two full weeks to The Simpsons Bracket last summer. The Simpsons is my second family, more or less. It could be much worse, I’m not that insane. But I love the show and want it to stay around as long as they want to. Today means this might be a possibility. Excellent.